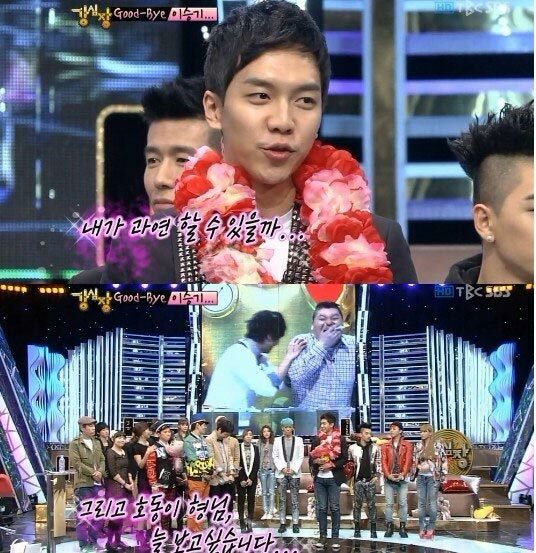 Lee Seung Gi was leaving behind tears on his last recording for Strong Hearts. On the Strong Hearts broadcast on April 3rd, 2012, every single singers and artists belong to YG Entertainment appeared on the program, staging a YG special. Lee Seung Gi co-hosted the variety show Strong Hearts with Kang Ho Dong beginning from 2009, but in 2011, Kang Ho Dong suddenly retired from entertainment circle, and thus Lee Seung Gi has been hosting Strong Hearts alone for about 5 months. In the end, for various reasons he withdrew from hosting the Strong Hearts. In addition, after the leaving of Lee Seung Gi, Strong Hearts is hosted by Lee Dong Wook and Shin Dong-yeop.